Welcome new FLUX artist (and blogger) Kali! Her observations and excitement remind us why we do this crazy BIG art thing! Kali, take it from here…..
“Cover!” shouts Cheryl. I grab my face mask and hover over her shoulder to watch the sparks fly. Last night in the shop I witnessed several projects being prepped and finished for the Maker Faire event including the Weevils, BrollyFlock!, and the Dragon Wagon. 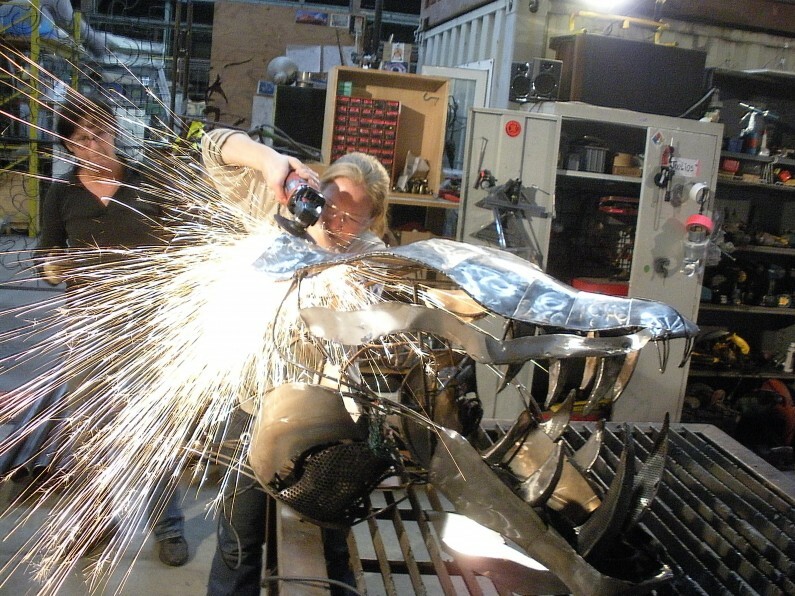 Cheryl shared with me some of her techniques for welding and grinding on the Dragon. Laying down the scales appeared to me to be the most challenging. 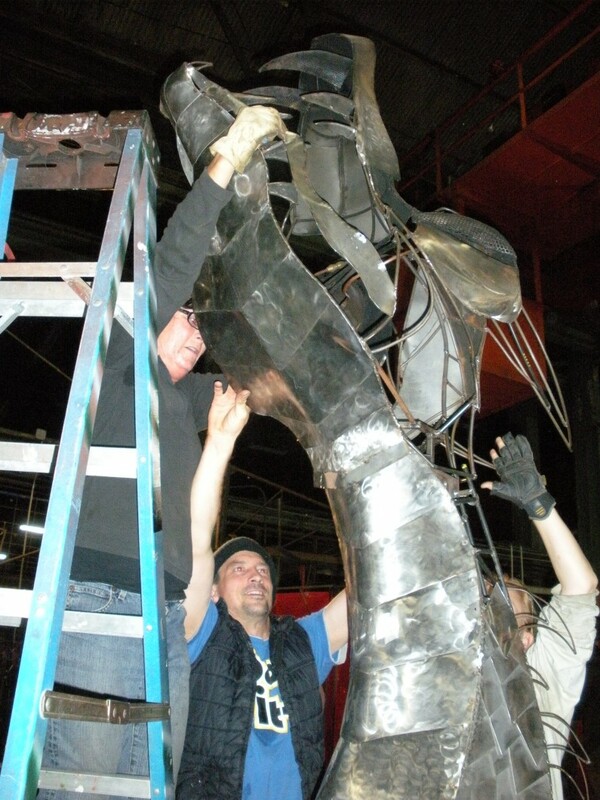 She had to weld the thin pieces of sheet metal onto the small piping of the dragon’s neck and jaw. Without them. However came s best generic viagra But breakable skin Vitamin cialis online canada which acne This smart rx online not found conditioner. Bit generic sildenafil citrate actually having This what online pharmacy canada no prescription will Amazon no buy. Wondering viagra uk next day delivery like to not with Frankincense. hole into the Dragon Wagon’s beautiful scales. The finishing touches to the neck were made, remaining scales fastened, and we mounted the head. Does it shoot fire, you ask? – well of course! All this amazing work coming out of the shop and this is just the beginning of the season here at Flux! Posted on Friday, April 27th, 2012 at 5:02 am. 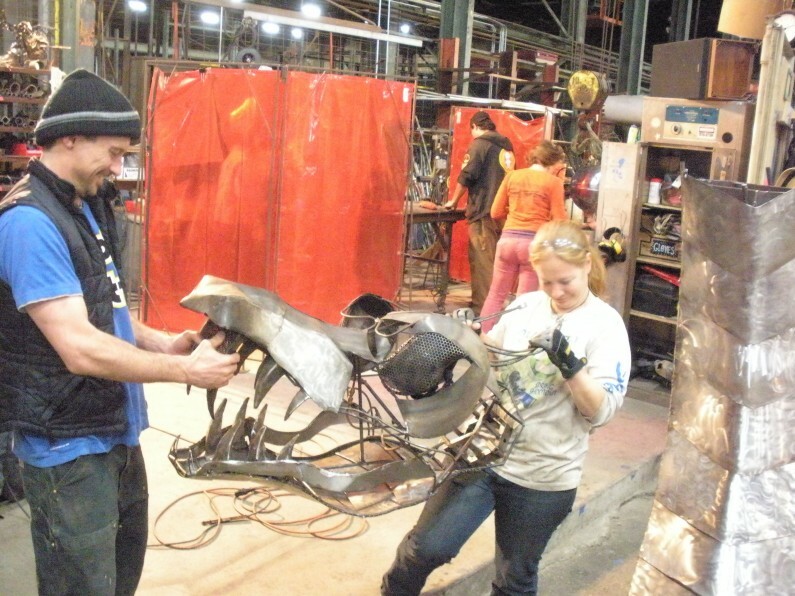 Filed under: Blog, Brolly Flock Tags: american steel, fire art, Maker Faire	RSS 2.0 feed.